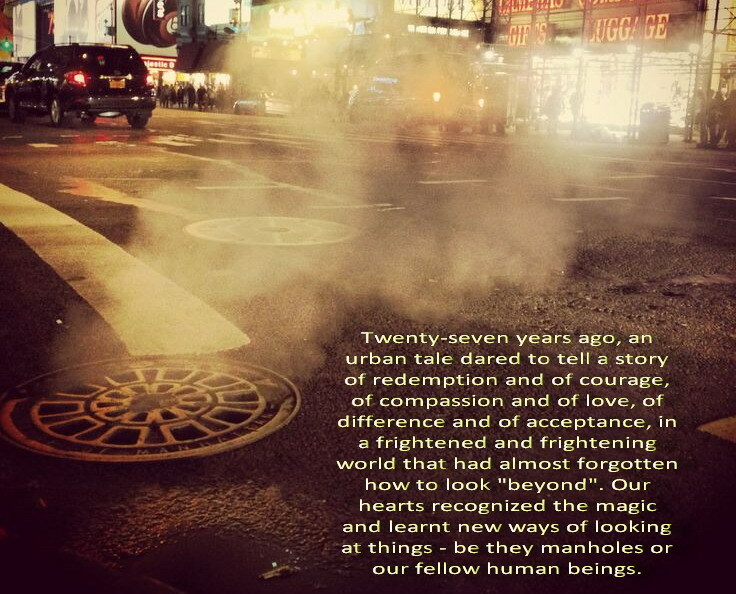 Today, how can we protect, honor and pass on this magical, symbolic urban tale, so that it can speak to more hearts? The answer lies within each of us, who love the show -- but however we choose to do so, we can rely on miracles to keep happening to help this faithful, stubborn fandom. Beautiful people keep finding the manholes, hidden in plain sight, that open the way to incredible worlds of fantasy, of nurturing thought, of friendship. The miracle of creativity keeps happening as well. And also the miracle of finding new material related to the series, after so many years! An unexpected miracle that both helps us to understand the process of how the show was made, and feeds our dreams and thought provoking conversations. So, here's the BatBland menu for the 2014 celebration of the First Airing Anniversary. BatBland honors creativity - of the good, old, slow and deep kind. Chess, not videogames. Slow thinking, not frantic clicking. In this land apart where the Blue Bird sings rather than tweeting, a brand new and a day-one fan decided to create their own websites and to start offering there the fruits of their talents. On this day, let's welcome Cindy's and Rosemarie's Beauty and the Beast web pages. Speaking of slow thinking and not frantic clicking, an almost unnoticed message lost among hundreds of other messages, months ago, prompted a chain of events that led to a treasure of knowledge about the show which was patiently waiting to be discovered: the George RR Martin Archive about B&B, which has been revealed to be a potential source of great new information about the show. A first visit at it was paid and a presentation shared at the last B&B convention in Minneapolis, and today we are posting it for all fans to enjoy. To complete the offering, we are adding a few interesting items shared by the great fanfic writer Cynthia Hatch, of Kaleidoscope fame, from her personal archive from the early days of fandom. Oh, and last but not least, another minor miracle keeps happening: the dates of the B&B year celebrations are becoming more and more a fandom tradition and are being celebrated all around. It feels good.